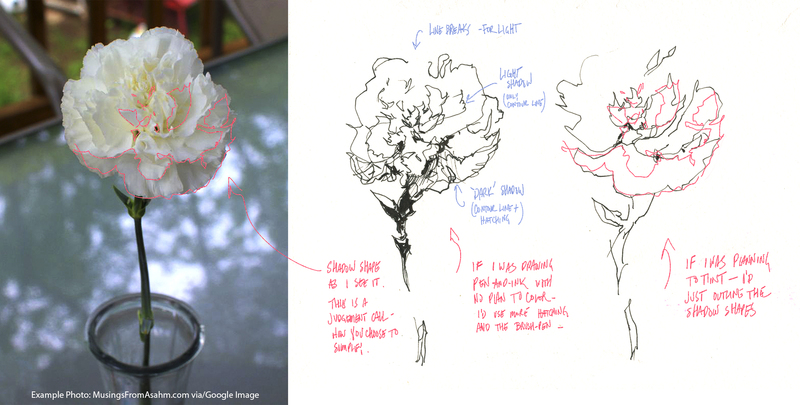 I have a follow up question this morning in my Craftsy.com travel sketching class, on the topic of sketching flowers. Now, I am not by any means a botanical artist. I’m not even a painter of flowers in watercolor (not yet!). I know the botanical people are committed to accuracy, and the flower painters are all about lush color and beautiful compositions. But this particular class is more about being able to sketch anything, anywhere, anytime! I think this question has been tricky to answer in the class, because I’ve been going on and on about drawing shadow shapes – and often students think I mean *darks* when I say shadow shapes. But of course, some shapes are quite pale. They’re still shadows on a form though! And naturally – a high key, delicate thing like a flower – that is something ill suited to pen and ink in the first place. So it’s going to take a light touch! BUT – we can’t shy away from that. Just go for it, and think – less is more when it comes to this sort of thing. Here’s two little sketches – first – if I was going to just draw this flower in pen-and-ink, and second, if I intended to paint it. In point of fact, if I was going to paint it, I might draw that in pencil, so the line was even less dominant. But – for the purposes of this demo, this is a Platinum Carbon EF nib fountain pen, and a few touches of the Kuretake Sumi Brush pen. Some notes – see the pink line drawn over the photo (click to enlarge) – that is what my eye is ‘tracing’ when I’m drawing the shadow shape of this flower. Here’s some light washes. See how I’m using that shadow shape like a map for placing the color? This is how sketching helps us learn to paint. Over time you’ll train yourself to see these shapes without a guideline. But when you’re sketching fast – that pen or pencil line is invaluable to help you paint it later. (Just like the other day, when I was sketching from life, and painting after). So that’s going out for Louise B :) Hope that helps clarify my earlier explanation! Thanks for sharing, Marc! And hello from Calgary. It helps a lot a beginner like myself to see step by step how you would tackle a subject like flowers! Brilliant! Great to hear from the Rockies! My alma matter: ACAD in Calgary! Am taking your Crafsy class and it is EXCELLENT. Your flower tutorial is bloom’n great! I love the wash effect. This IS bloomin’ great – thanks! Thanks so much! I have a white peony..I am going to try. Thanks, Marc. This is perfect. I haven’t checked into the travel sketching class for a while. It’s probably a good time to do a refresher and look at the different conversations. I sketch a lot of plants….this is extremely helpful!!! If you feel like doing a quick demo on sketching “plant masses” I would love to see that!!! Although, I think this demo technique can also be adapted to plant masses. I’m going out to give it a try! Always a pleasure to see how you work and approach different subjects. Looks simply incredible! Love the fluffly looks you gave to the flower. Enormously helpful! I have been obsessed with painting watercolor flowers for a few months now – very loose, no pre-sketching, and your explanation gave me stars in my eyes because I was able to ‘see’ in a way I hadn’t before! Thank you! OMG Marc, thanks, you really made it clear for me now!!! Can’t believe you did all this to answer my question. I really appreciate this and will keep a copy of your wonderful work, study it. Hi, Marc, I love the clarity you bring to your postings! Here the notes and color outlines along with your wording really help! Thanks so much! I’m in the middle of a nature theme and nearly managing to avoid sketching flowers… part out of confusion and fear because I’m just not sure how to approach them. I love seeing your eye tracing lines for your sketch. Really appreciate seeing the steps in this post. Immensely helpful my friend!! Great demo! Thanks for sharing! Beautiful sketches and paintings! Thanks so much for sharing the process! I really enjoy looking through of all of you art and reading the captions. They help a lot, especially when I’m trying to figure out ways to draw something.